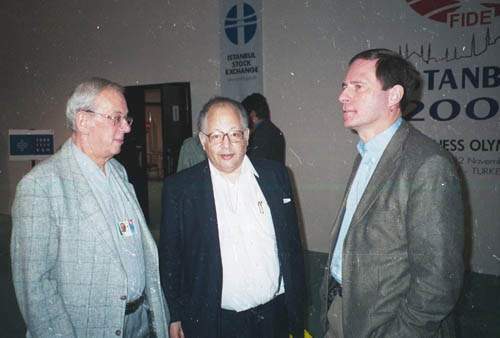 Plotting the Revolution: Egon Ditt, left, of Germany, Gunther Loewenthal of Holland and Herman Hamers, President of the Dutch Chess Federation, discuss the FIDE Commerce plan shortly after it had been voted upon. Lowenthal spoke strongly against the plan and voted against it. Egon Ditt voted in favor but now seems to have doubts. 40 moves in 75 minutes, rest of the moves in 15 minutes, each move additional 30 seconds. The new time control needs an electronic chess clock. As the Chess Federation of the Netherlands in a letter dated 8.1.2001 states, rapid chess would become the official form of chess. We assume the FIDE-Board is expecting more interest from the media and easier organization of tournaments (less hours and perhaps two rounds a day). In the letter already mentioned, from 8.1.2001 the Chess Federation of the Netherlands has entered a protest against the decision. The federation states that the time control has not been discussed in the FIDE-Congress at Istanbul (a proposal of GM Shirov supported by GM Torre was in the documents). The Executive Council had proposed to ask the players in the Olympiad for their opinion, but that was not done. Instead, the participants in the World Championship in New Dehli have been asked regarding shorter time, but without any concrete proposal. The Chess Federation of the Netherlands refers to contradictions in several valid regulations of FIDE, so it would not be possible to have title norms with the new time control. But the decisive argument against the decision is that according to the statutes, the FIDE Board is not authorized to take such a decision. Because of this, the Chess Federation of the Netherlands states that only the General Assembly of FIDE, that will meet in autumn 2002 in Bled / Slovenia, after a thorough discussion concerning the future of chess can take a decision reaching that far and touching the core and the level of chess. The federation asks the President of FIDE to cancel the decision and to put the issue on the agenda of General Assembly in Bled 2002. With a letter dated 21.1.2001 the German Chess Federation has fully supported the protest of the Chess Federation of the Netherlands. The federation points out that federations have been informed only by a press release distributed on the Internet and that no German top player has supported the new time control for serious chess in a meeting of the German national team in Düsseldorf 17.1.2001. It is the position of the German Chess Federation that the decision of the FIDE Board is not valid, because the Statutes of FIDE do not cover it. The time control as defined in the FIDE handbook still has to be applied. German Chess Federation also objected to the intention of the FIDE Board to have the qualification for the World Championship in continental tournaments. This decision will destroy the zonal tournaments and by this the function of the FIDE Zones. In this case neither national federations nor - to our knowledge - the Zone Presidents have been consulted. Since there has been no emergency as demanded by the statutes, the FIDE Board is not authorized to decide in this case. "We shall not tolerate the violation of the statutes", said Egon Ditt. "We have to remind the FIDE Board that only the General Assembly, the body composed of delegates of the national federations, has unlimited authority to decide, and the Board has to stay within the framework of the decisions of the General Assembly". UPDATE TWIC Reports that the French, Italian, Dutch, Canadian and several other chess federatons have joined the protest against the new time controls.